For those of us in the northern hemisphere, the school year has come to an end and weâ€™re all looking forward to summer vacation. Bring it on! And our 2016-17 Cool Tools for School workshop has also come to end. 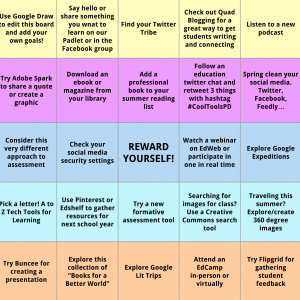 But if youâ€™re like me and you want to keep learning over the summer (in between picnics, vacations and some relaxing down time reading some good books), then check out Cool Tools Summer Bingo Board.